This is a modern building with a long history, stretching back to the middle of the 19th Century when it was formed as an offshoot of the St Nicholas Congregational Chapel in the town centre. The St Nicholas chapel, pictured on the left, is most famous today for its minister in the 1860s, William Tozer, who was one of the main protagonists in what became known as the Akenham Burial Case. The congregation opened a mission church on the corner of Cowper Street and Spring Road, in the California area of the town, so-named because the rapid expansion of Ipswich to the east coincided with the Californian gold rush. California Chapel went from strength to strength, eventually becoming established as a congregation in its own right. 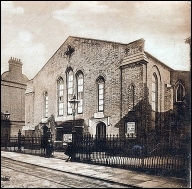 It was renamed St John's Congregational Chapel after the name of the local civil parish and council ward. 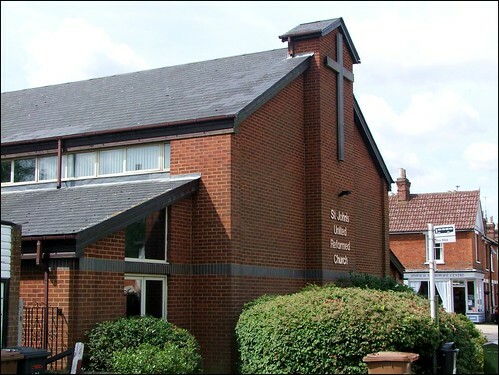 In the 1970s, the community here joined the United Reformed Church, as most of the more liberal Congregational churches did at that time. The town centre chapel closed, and was demolished, in the 1980s. The site was sold off, and enabled the rebuilding of the California chapel. The happy result is a fine multi-purpose building, perhaps without the character of its predecessor, but in busy use by both the congregation and local organisations.